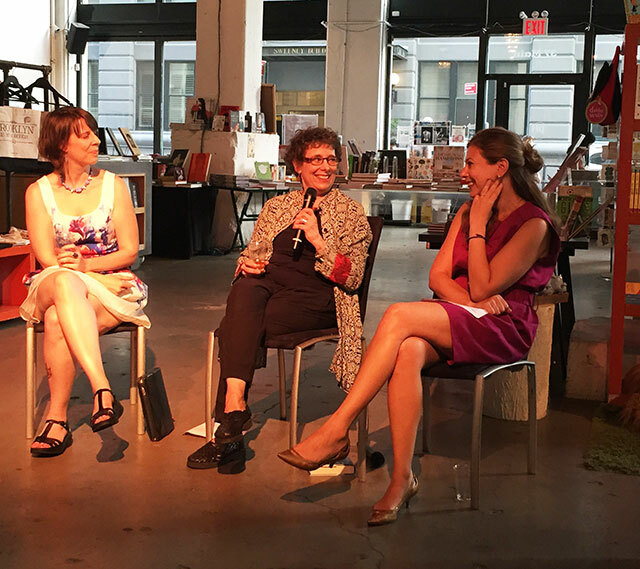 Stephanie Kallos was at Powerhouse Arena to read from her latest novel Language Arts and discuss the book with voice actor Tavia Gilbert and editor Lauren Wein. The book follows Seattle area high school English teacher Charles Marlow, a man who loves puzzles and language arts. Kallos says she usually pieces her characters together from many different people, but this novel began somewhat differently. She wanted to write about her childhood friend, the inspiration behind the character of Dana. Dana, she says, is a character she had wanted to write about for a long time, and he was the primary reason to write the book. Early drafts of the novel had no plot, Kallos explains, because she was focusing on Dana. 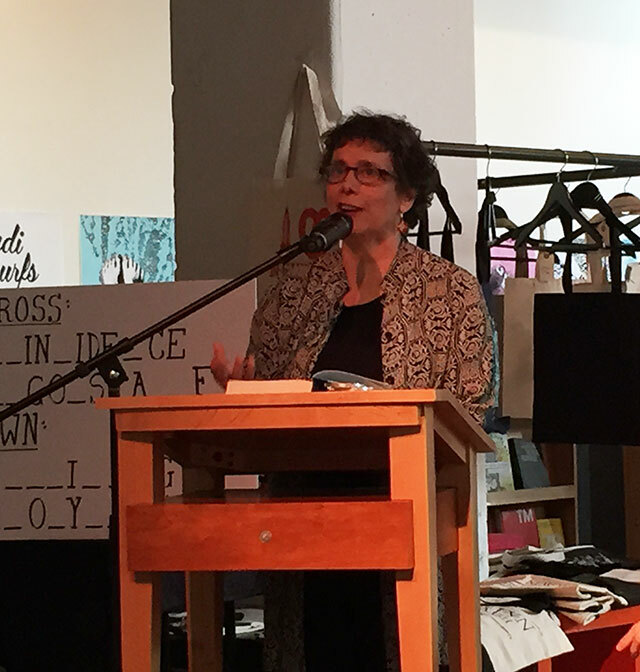 During one of the drafts, Kallos attended an Anne Lamott reading event where Kallos had an epiphany. She had never really written about her complicated relationship with prayer or God. She realized she would have to confront the issues. Finally, the book had structure. Charles and Dana become childhood friends creating the missing plot. Kallos praises her editor, Lauren Wein, for dealing with the many drafts. They first met in 2003. Kallos had sent Wein a manuscript. Halfway through, a character materialized that caught Wein’s attention. Wein was sitting shiva, the Jewish mourning period, for her grandmother. The character in the manuscript captured her grandmother so perfectly she felt as though Kallos had brought her back to life. Since that book, Wein has switched publishers, and with Language Arts, Kallos followed her. Editors are often stretched thin with a heavy workload. Kallos though likes the attention that Wein gives her manuscripts. Kallos sees editors like great stage directors accepting the story they have and simply pulling out the best performances from everyone involved. Wein acts like an arrow pointing to where things should go, Kallos describes their relationship. Influences from the theater are a big part of Kallos’s writing. She started out as a voice coach and she has worked as an actor. She takes inspiration from great playwrights, like William Shakespeare. As an actor, she worked in a Shakespearean company, a challenge for women given how few female parts there are. Shakespearean characters are always multifaceted, she says. Villains have redeeming qualities, heros have imperfections. She likes the dimensions that those qualities allow. As a voice coach, she is very aware of the physicality of language and the way sounds comprise speech. Even though she doesn’t usually read her work aloud during edits, she explains that she hears the way things sound in her head. Though Kallos is a trained voice coach, she doesn’t read for the audiobook recordings of her own novels. Tavia Gilbert, a former student of Kallos, does the readings. She describes the role of the audiobook actor as responsible for bringing the entire story to life. She makes notations on the texts, looks up pronunciations of words she is unfamiliar with, and highlights characters’ biographical information to create a characterization for each. For Kallos, she rather write books than record readings of them. Besides, she likes finishing with her books once they’re written: “By the time I’m done writing a book–I’m done,” she says.